Happy Halloween! We baked monster treats, went trick or treating at Havenhollow, and read spooky ghost stories. We had a wonderful Halloween! You can read about it in THIS PLURK and WATCH IT IN THIS VIDEO! This is not a fashion post, but I will tell you where we got our family costumes because it was really hard to find one. I started looking for some sort of theme costume that had fitmesh Maitreya or Slink for me, fitmesh Slink Male for Hiram, and fitmesh toddleedoo for Cindy Lu, and I really thought I would find a variety of costume options. I did not. We had ideas of being The Flinstones; Dorothy, The Cowardly Lion, and the Tin Man; Various groups of Superheroes, Star Wars characters, and a host of other nerdy groups- but we could not find them. 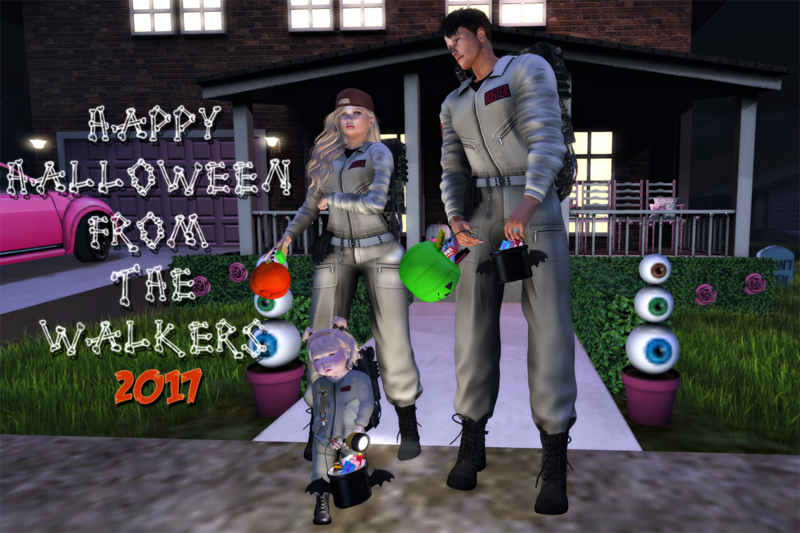 Finally after a weekend binge Stranger Things 2 marathon, I decided to look for Ghostbuster costumes and FINALLY we found some that were made for families. These costumes were great and they are updated and fitmesh for all the major bodies. There were actually so many body choices in each pack. We loved our costumes. Thank you for making them and please make more!! !